Paper Crafts by Candace: Jaded Blossom Stamp Release day 2!! Happy day 2 of the Jaded Blossom Stamp Release!! Here is what I created! I cut out my paper using the Card Mat Dies and then added glittery silver washi tape for the background. Then added the new icicle and snowflake dies along with my sentiment on a flag die! Easy peasy!! Thanks for checking out my project today! make sure to head over to Jaded Blossom to see what the rest of the team made! This is gorgeous! 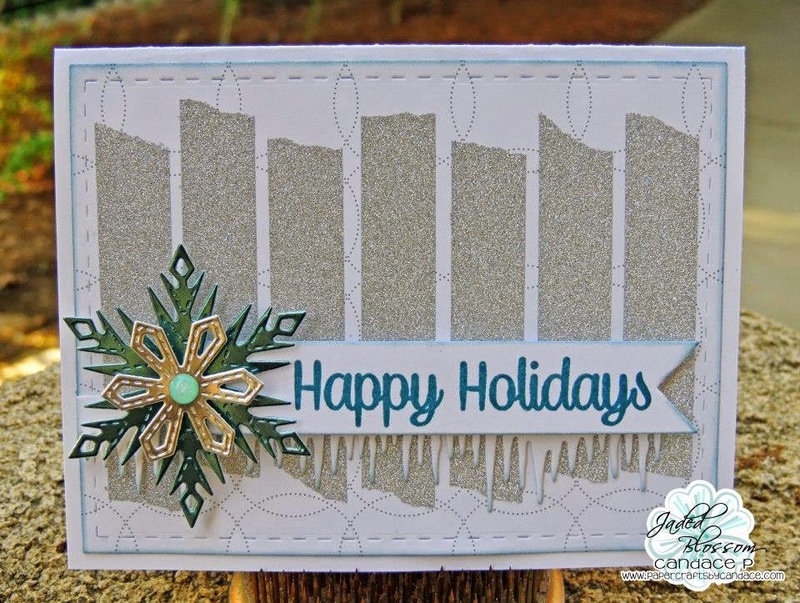 That paper you used on the snowflake is so elegant looking and I love the washi tape background! This is so pretty!! I love the metallic paper! Soooo pretty! I love the Winter Dies!! LOVE!! Beautiful. love the 3d Snowflake makes everything perfect.